Vietnam’s Environmental Police have confiscated two frozen tigers and a frozen panther in the central province of Nghe An. Hanoi, Vietnam — Vietnam’s Environmental Police have confiscated two frozen tigers and a frozen panther in the central province of Nghe An. The animals, reportedly along with five kgs of suspected tiger bones, were confiscated from the home of a 53-year old man in Dien Chau district early last week. The suspect was placed under arrest. The confiscation resulted from a co-ordinated effort between enforcement authorities, including the recently established Environmental Police. TRAFFIC, the wildlife trade monitoring network, commended the authorities for their diligence in enforcing Vietnam’s wildlife laws. TRAFFIC is a joint programme of WWF and the International Union for Conservation of Nature. “The Environmental Police have demonstrated once again their dedication to halting the illegal trade in protected species such as tigers,” said Thomas Osborn, Co-ordinator of TRAFFIC’s Greater Mekong Programme. Despite their protection under Vietnamese and international law, tigers and panthers continue to be illegally hunted and traded across Vietnam and Southeast Asia for their meat, as souvenirs, and for their bones, used in traditional medicine and to make tiger bone wine. In March this year, Lao Bao Border Guard Police seized a body of a tiger (95 kgs) and a black panther (27 kgs) being transported across the border to be sold in Vietnam. 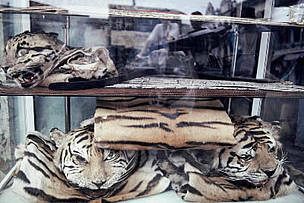 In October 2009, Vietnam Environmental Police seized two frozen tiger carcasses weighing a total of 130kgs and arrested five suspects in Hanoi. As few as 30 wild tigers are estimated to survive in Vietnam. “If we hope to save the country’s remaining tigers and other threatened species, it will take ever increasing vigilance from authorities and a strong commitment by the government to support and promote existing wildlife laws,” said Osborn. Tigers have become a global icon for species on the brink of extinction, especially during the current Chinese Year of the Tiger. There are as few as 3,200 tigers left in the wild around the world. WWF and TRAFFIC are working this year to secure political commitments that will double the number of tigers by the next Year of the Tiger in 2022. Tiger skins and other rare cats are openly displayed for sale in Cholon District, Ho Chi Minh City, Vietnam.